We started out on an alarming note, but once we cleared security, it was “all systems go.” Inside the dusty warehouse, six volunteers set about going through boxes and boxes of photos and documents crammed into corners. Our mission was to sort and archive historical photos and documents and create a computer database that would facilitate future research. The most difficult task was figuring out how to categorize and code the photos. Luckily for us, one of the volunteers provided an existing encoding key format, which we adopted and modified to fit our needs. We found that we were better off keeping the categories to a minimum (i.e., four major categories based on scenery (S), property (P), people (Pe), and special use (Su), with subcodes within each category) rather than having to deal with an infinite number of possibilities—though the final list was not short by any means. For example, we encoded a railroad-logging photo as “Sulr” (special-use logging railroad), whereas a cabin photo was encoded as “Pbu” (property building). We also filled out a log for each photo consisting of catalog number, previous catalog number, medium, negative, photographer, date, subject, location, comments, and recorder. Photographs within each code type were listed in spreadsheets containing the following information: topic, Code A (e.g., “P” for property), Code B (e.g., “bu” for building), place, and number. The photos within each code type were then numbered consecutively. After we had established a systematic process, the group busily trekked forward. 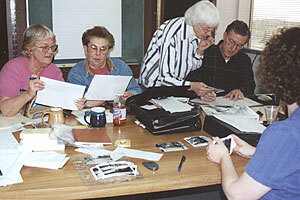 As one group sorted and coded the photos, another group scanned the images into the computer, which were then copied onto CD-ROMs. The catalog log slips from the scanned photos were entered into a database, and the scanned photos were filed in archival photo jackets based on category code type and placed into binders. We found that four days was just not enough time, and we wasted not one second. Although we did not get to the documents, by the end of the week, we had managed to recover and scan well over 700 photos ranging in date from the 1860s to the 1950s. Many thanks to my outstanding volunteers, Betty, Dan, Karen, Michelle, Joyce, and Elaine. Thanks so much!